This website defaults to Romanian. Click the English button in the upper right. 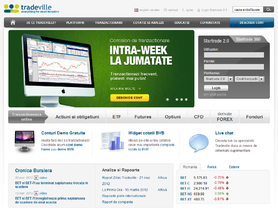 I have traded with Tradeville for 2 years. Excellent customer care, excellent Education tools and excellent trading platform (they are using Startrade 360 as GFT ) The negative thing is that when important news are coming the spread gets crazy and also there is huge risk not to see ur trades executed at the entry/exit rate u ask. Another negative thing might be they only offer 1:100 Leverage. But one thing I loved working with them is NEVER had problems with my withdrawl. They always paid me in 2 days since I made the request.